All Santa Paula homes currently listed for sale in Santa Paula as of 04/24/2019 are shown below. You can change the search criteria at any time by pressing the 'Change Search' button below. If you have any questions or you would like more information about any Santa Paula homes for sale or other Santa Paula real estate, please contact us and one of our knowledgeable Santa Paula REALTORS® would be pleased to assist you. "Secluded 33+ acre estate with a beautiful 3700+ square foot custom single story home with views galore out to the mountains and hills of Wheeler Canyon. Hawks soar above the home featuring massive wood beams throughout the entry, living room, kitchen, dining area, and master bedroom. The living room has a fireplace with local fossil stones. All rooms have picture windows framing the views of mountains that surround the property and terra cota tile flooring. A serene property with patios nearly surrounding the home. The 33+ acres have over 80 organic fruit trees, and vegetable and herb plants, wildflowers everywhere, and even a private fish pond. Plus, the property has 2 utility cargo containers, one with flooring and electricity for air conditioning. Property has a private water well with 5 tanks. The property also has a custom hen house with egg laying hens and a separate playhouse with water and electricity amidst the fruit trees. Also, a 2 car garage plus carports for 4 cars easily accessible with the circular driveway. Welcome Home!" "Escape and experience true local country living at it's finest. This truly is Luxury Country Living with this exquisite ranch property. Two log cabin style homes, nestled on 20 acres, gated with private entrances and mountain views. Experience true beauty and nature surrounding you. These two homes are a hidden treasure. The larger majestic home is approximately 6K square feet, three stories with an elevator and an attached 3 car parking garage. Plenty of space for RV, and can comfortably fit an additional 4 vehicles. It features a full kitchen. The third floor has its own private entrance along with a master suite, fireplace, wet bar, steam room, his and hers rock shower and a Jacuzzi tub. The second home is an exquisite single story 3 bedroom 2 bathroom home with a fireplace, 3 car garage and storage areas. Much more to see and view, welcome home! Live in one and rent out the other. You and your family will truly experience the seclusion of country paradise living. 7481 Wheeler Canyon Road - Approx. 1190 sq.ft., 3 car garage and storage area Approx. 1.274 sq.ft." "Cattleman's Paradise! This 3,000 sq ft 4br/3bth single-story custom home on 19+ acres is set in a private corner of Wheeler Canyon, located between Ventura and Santa Paula. High vaulted ceilings, solid hardwood floors, and a modern country kitchen with center island are some favorite interior features of this meticulously maintained home. TWO OVERSIZED MASTER SUITES with private baths & large walk-in closets are located at opposite sides of the home. A wrap around covered porch includes handicap ramp and spa. Outside, a 40'x 60' barn/workshop has an oversize automatic roll-up door; solar panels on the roof keep utility bills to a minimum. A SECOND BARN, original to the ranch, has all the charm of a bygone era; a modern 3-CAR GARAGE attached to the barn, has direct access between the two structures. Six 2,500 gallon water tanks provide 15,000 gallons of storage, fed by TWO PRIVATE WELLS on the ranch. Stately oaks and majestic pepper trees are clustered throughout the property. The entire property is fenced and cross fenced for large animals; the current owner allows 12 head of cattle and horses to free range on 17 acres. Three large corrals, arena, wash rack, tack sheds, and several dog pens all thoughtfully use the north corner of the ranch." "This magnificent Tuscan Style Home on 1.22 acres offers the ultimate in privacy with easy city access. Enjoy 360 degree breathtaking views from almost every room! Designed with an emphasis on entertaining, this stunning beauty is nestled in a gated resort-like atmosphere surrounded by tranquil gardens and groves, boasting a beautiful water fountain adding instant calm, a koi pond, a pool, an in ground spa with grotto, paddle tennis court, built-in gas BBQ, fire-pit and a wealth of entertaining spaces. A lush oasis of lawn and tropical plants, avocado trees, and over 60 fruit trees adds to the charm of this exquisite home. Property has been updated with high quality upgrades. Home features a free flowing floor plan with 5 bedrooms including a downstairs master bedroom, 3 bathrooms, a great room, a loft, 3 fireplaces, chef's kitchen with center island, a formal dining room, a family room with surround sound, soaring 20 foot coffered ceiling in the living room, floor to ceiling windows offering abundant views, beveled glass French doors, plantation shutters, ceiling fans, several arched doorways, two sheds and much more! The south/western exposure captures sea breezes, streaming natural sunlight throughout, and the scent of roses from the garden." "Picture perfect 2.16 ac farm in the heart of the bucolic Santa Clara River Valley, located between Ventura and Santa Paula. TWO SEPARATE RESIDENCES, PLUS a one-bedroom APARTMENT, provide multiple income streams for the long-term homeowners. The property is also ideal for a large family with multiple generations. At the front entrance, the original 1,450 sq ft 1930's FARMHOUSE has 2br/2bth; it has been fully remodeled to today's standards. The farmhouse yard includes a two-car carport, small workshop, enclosed dog run, and plenty of parking for work trucks, horse trailers and large RV. Tucked behind a second security gate, the 1959 MID-CENTURY-MODERN main residence has 4,000 sq ft with 4br/3bth; an attached 1br/1bth apartment with separate entrance can be closed off or opened inside to the main home. The OVERSIZED GREAT ROOM, large open kitchen, and vaulted ceilings are just a few favorite features of the one-story home. The private yard includes an in-ground pool, 90-foot shop building with 4-car carport, enclosed 1-car garage, covered hay barn and two tool/work rooms. At the back of the property, an 80' x 60' foot horse corral can hold 4+/- horses and other farm animals. Fruit trees throughout the property include avocado, lemon, orange and walnut." "Looking for a private secluded rural rustic ranch? This ranch has incredible privacy and all that you could imagine and more! It is a single story 3 bedroom 2 bathroom home that is approximately 2,000 square feet and a basement with the same size square footage as well. A barn, workshop, and so much more! The property includes two APN numbers with a total of each parcel being approximately 16.5 acres each." "Take the Bear-Creek-Ranch Virtual Tour and soar above an amazing property (3 videos attached). Over 39 acres in the Upper Ojai Valley with Topatopa as a backdrop and Bear Creek running through it. Behind gated entry and down the private drive, a handcrafted cabin is the Main Residence and offers two-story sunset views across the upper Ojai. Beautiful rock retaining walls and purposeful channels wend their way along orchard lanes and sparkling meadows shaded by native oaks & sycamores. The primary Ranch road heads northward past... the Guest House, next... the versatile 3000-square foot Industrial-Ag building, and eventually... loops around 20 acres of avocado & citrus perched on the parcel's northwest corner... across Bear Creek. Processing/greenhouse structures are adjacent to the groves. Multiple wells and a spring offer permaculture possibilities. Surround yourself with nature's breathtaking views. Experience the quiet. Retreat in conscious community. Restore this gem and make it your own... inspiring. The Sespe Wilderness is near." "26.73 acres with 2 bedroom, 1 bath manufactured home currently rented, and a large barn nicely finished on the inside. Plantings include organic Lemons and Avocados CCOF and CDFA certified.. Exact planted acreage is unknown, but approximately 20 acres are suitable to farm. Ag water is supplied from the Santa Clara river and the City of Santa Paula for domestic use. Income from the property fluctuates up to $100,000 per year, gross. Owner may carry a small amount." "Own the largest hangar at historic Santa Paula Airport! (Santa Paula Airport's only 50-ft deep Hangar)- 6,100 total square-feet of luxury hangar, work, and living space.- Footprint of two hangars in one, loaded with improvements -- Space for multiple aircraft- Fee-Simple Ownership - You 'Own the Dirt'- 53' Wide X 14' Tall Bi-Fold Door- 12' High Mezzanine & Workshop- Living space includes: - 2 Kitchens/Galleys & 2 Bathrooms with Custom-Tiled Showers - A/C, Skylights, Water Softener - Large Hot Tub, Pool Table, Rooftop Deck"
"This is a famous and historic home in Santa Paula on 2.19 acres. It is not an opportunity for demolition and development or commercial uses due to zoning. The main house was built in 1883 and is approx. 4,153 sf with 7 bedrooms and two bathrooms, all on the second floor. The dwelling is a fixer upper. Acquiring this home means a season of labor is ahead but inspired by the love of the historic elements and dedication to preserving this architectural masterpiece. Downstairs is comprised of a large foyer, formal living room, parlor, dining room, library, kitchen. There is currently no heat, natural gas, sewer or septic. There are two other dwelling units on the property and a large barn. The units are being moved onto concrete pads and foundations.The units have been moved onto concrete pads and foundations. One unit is a studio attached to the garage. The barn will remain where it is and stabilized for safety. The parcel has been created as a result of an agreement with Williams Homes and the City of Santa Paula. There will be 36 new homes built to the west and the north. There will be private access to this property and wall between the homestead and the development. Buyers must be aware of the restrictions as to the alterations." "One of the cities finest homes combining the California Bungalow Style with the Colonial Revival period featuring exterior shingling, Palladian styled windows, gables with knee brackets, portico, and awesome views of the valley. The exterior patios are ideal for entertaining and feature hand cut rock walls and steps plus custom designed wrought iron handrails. The interiors feature hardwood floors, formal dining room, and view living room with fireplace. The owners report the house had upgrades to the plumbing and electrical in the 1970's and 1980's. The kitchen has a 1970's remodel that some buyers may want to change. The garage, built when cars were smaller, won't accommodate large SUV's. Sunny and warm with classic large windows with expansive views. Also known locally as Santa Paula's 'White House.'" "This is the ideal parcel size - 2.47 acres! This country style home in the country has an amazing view of the Santa Clara River and the mountains. The home sits on the high side of South Mountain Rod (note spelling of the road). There are three bedrooms with one currently being used as an office. The screened in room adjacent to the great room keeps winter out and summer in. The living room has a fireplace and serves as the dining and family rooms. Long time owners since 1972 are ready to pass this loved home on. Guest quarters are attached to the double car garage; single room and bathroom only. Wonderful and scenic for outdoor life and the space we all long for." "The Oaks of Santa Paula is widely known as a rural and lovely neighborhood with unique homes shaded by majestic oaks trees. Aldersgate Construction, Inc., presents the newest neighborhood in the oaks called Arbor Executive Homes. All homes are single story; only four lots are eligible for a second story. Minimum square footage of Plan 1 is 2,626 sf; Plan 2 is 2,9324 sf. With a second story, Plan 2 has 3,590 sf. Plan 3 has 3,407 sf and is a single-story unit. Each one is an Elan Smart Home for efficiency in lighting, thermostat control and video doorbell conversations on your cell phones. Amenities include: 3-car garages, fireplace, laundry room, open patio, and central vacuum system. Each lot is approx. 1/2 acre and uniquely designed for 3 floor plans with opportunity for 8 elevations featuring Spanish-style, Craftsman, Ranch with a touch of mid-Century style. Street names: Arbor, Jacaranda, Forest Drive. There is a lot set aside for a park and play area. The HOA covers front landscaping, park, and water diversion. Prices start at $795,000. Top price for a Plan 2 with one story - $895,000. Neighborhood will be built in 3 phases with six lots in phase 1; 6 lots in Phase 2 ; 7 lots in Phase 3. Almost no curbs, sidewalks or street lights. Oh, the Oaks." "Spectacular views welcome you to this highly upgraded picture perfect home overlooking the Heritage Valley. Oversized private lot perfect for entertaining. Gourmet kitchen with large island, granite counters and upgraded appliances. Wine lover? This home has multiple refrigerated wine storage plus the most amazing view to enjoy a glass as you look out over the city lights. Luxury master bedroom and bathroom with separate tub/shower, dual sinks and his and her walk-in in closets! Excellent floorplan with 3 bedrooms plus a built in office loft (that could be the 5th bedroom) upstairs plus a bedroom with a full bathroom on the first floor. The kitchen is open to the family room where you can warm up by the fireplace. So many upgrades to list like built in cabinetry, granite counters throughout, recessed lighting, crown molding, security system, surround sound and an upstairs laundry room. This is one of the largest and most private lots in this sought after Ridgeview Estates community. Must see to appreciate all the luxury details in this one of a kind location!" "The Historic Jaycox House built in 1926 is available for the first time in 20 years! This amazing property was the first home built on the street & sits on a 9333 sq ft lot at the highest point on lovely Terracina Drive on Hospital Hill. This charming property has the feel of Tuscany and the English Countryside with a Vintage Fountain surrounded by an English Rose Garden & Cabernet Grape Vines. The large entertaining deck looks down to a sunken shade garden. Lovingly Restored, this cottage-style home has incredible valley & city views. Attention to details abound. The Main home features 2 bdrms & 1.5 baths w/original wood floors, beams & window seats. The whole home is light, bright & airy. The open living room boasts of a beautiful fireplace & French doors leading to the outdoors. Plus, an enchanting dining room looks to a kitchen w/a view window box. The Guest Quarters/Artist Studio is approx 1431 sq ft w/amazing vaulted ceilings, 1 bedroom & 1 bath & features an outdoor Loggia w/fireplace overlooking gorgeous gardens w/mountain & valley views. Native Sycamore, Pear, Fig, Orange, Lime & Avocado trees. 2 car garage. The Home, Guest Quarters & Property offers a feeling of Romance and Casual European Elegance. It is really too special to describe." "One of a kind classic Victorian era home built in the early 1900's and sitting on a remarkable 9000+ s.f. lot. The brick walkway leads to a wonderful porch surrounded by hand made original porch railings. Grab the rocking chair and a lemonade and spend some time, The foyer welcomes you as you enter. High ceilings throughout, original Douglas Fir wood floors in most rooms, lovely fireplace in the living room and a bright cheery dining room. The home has updated electrical and copper plumbing and has been earthquake retrofitted! 4 bedrooms (or 3 and an office) up with a wonderful remodeled bathroom featuring glass enclosed shower and tile floors plus custom vanity. There is so much to tell you about! The kitchen is perfectly centered in the home, with an enclosed sun room featuring storage, a bonus room, full bath with laundry facilities and trap door to the full basement. Leave the home - enter the spacious yard which includes a separate studio (now being used as an art studio), patios with outdoor kitchen and fireplace, 2 car garage w/ 220V and a 1960's (yes) bomb shelter. Even a stilt treehouse for the kids.It just has to be seen to be believed." "PICTURE PERFECT with wonderful views. Former Model Home...More than $150k in upgrades. Travertine floors throughout 1st floor. Real Wood plantation shutters and custom window treatments on dual pane windows. Family Room features gas burning fireplace and Built in Media Cabinet and book shelf. TV & all appliances included. Granite counter tops. Luxurious Master Suite with rustic hickory wood floors. Massive walk in closets. Huge oval tub...Master Suite and bathroom -- all with gorgeous view. Separate shower with glass enclosure. Double sinks in both master and custom guest bathroom. Owners have loved home since it was first built...they are downsizing and moving to be near family out of state. Welcome home to this Beauty!" "THOMAS FIRE DAMAGE! Property is not lendable for conventional financing - CASH OFFERS ONLY. Contractors and Investors are Welcome. Currently in Probate and is cleared to sell. Enjoy your own Hacienda on 1 acre of land. The cutest 3bedroom, 2bath home. Your home has a stylish kitchen and bathrooms with lots of spacious living area. Totally secluded, located between Ventura and the city of Santa Paula. Your ranch is waiting for your finishing touches. A/C, horse corral. Shared well." "Beauty and Style,Brand New Construction 2019. Open and spacious floor plan. Great kitchen with quartz countertops,ceramic water resistant floors including the bedrooms. One bedroom with private bath. Indoor Laundry room. Spacious living room and fireplace,large open and warm dining family room next to kitchen. 2 car garage + More." "Classic Santa Paula! This four bedroom home has most of its original charming and genuine features. The wood trim and crown moldings are unpainted. Wood flooring, tastefully remodeled bathroom and gently updated kitchen reflect the beauty of the early 1900's and the charm that those days of meticulous and beautiful craftsmanship. The Santa Paula Chromicle of 10/22/09 reportd on G.N. Ruggles 'handsome bungalow built by local builder Grant Kniffen for $2,500'. Located in the historic district on tree-lined Santa Paula Street lets you experience summer evenings on the front porch or on the gazebo in the back yard. The second story is the fourth bedroom or an enormous family and game room. There is rear alley access and room to build a two - car garage if desired or park RV's. This is one of the homes built for the first teachers at Santa Paula High School, directly across the street. This area is studded with beautiful trees and historic homes." 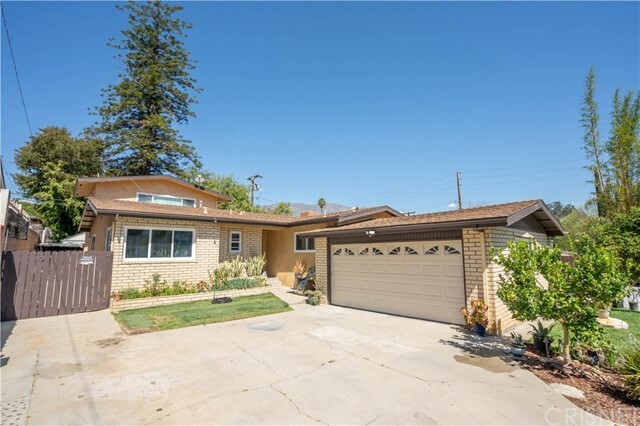 "Don't miss this opportunity to call this your home.This spacious hill top home above Santa Paula Hospital located in the Ridgeview community boasts 2,096 Sq. Ft. of living space. Kitchen features granite counter tops, under cabinet lighting, stainless steal appliances, and a huge center island/ breakfast bar that opens to the spacious living area. Downstairs Master suite plus one additional bedroom and full bath. Upstairs has one more bedroom and 3/4 bath plus a loft.This home in the Ridgeview community won't disappoint!!!" "This beautiful 1900 historic home is located near the Historic District of Santa Paula. 4 bedroom 1.5 bath, one bedroom is downstairs and a half bath. Located on a large lot near shopping, schools, parks & downtown Santa Paula. You have to view this home to appreciate what it has to offer. There is no garage but ample street parking and several private parking spaces behind the property gate." "Calling all Builders and Developers good investment opportunity City of Santa Paula has rezoned lot Seller may carry"
"This beautiful home is nestled on a quiet cul-de-sac amidst gently rolling hills in a fantastic Santa Paula neighborhood. Here are just a few of its many other fine features: Lush landscaping, colorful planters and a towering swaying palm tree enhance its eye catching curb appeal. You'll step into a freshly painted 1,993 square foot open concept floor plan that is in Move In Condition. A multitude of window bathe the spacious living room in natural light and it also has a floor- to- ceiling brick, gas/wood burning fireplace. The family's cook is going to truly appreciate the kitchen's abundant cabinets, tile counters with full backsplash, built in appliances, easy care tile flooring plus the convenience of the adjoining dining area. A total of 4 bedrooms and 3 1/4 bathrooms. 2 of the 3 downstairs bedrooms are configured as masters, they each have backyard access and they share a sumptuously appointed huge Jack & Jill bathroom. The gigantic upstairs bedroom has its own balcony with panoramic view and 1/4 bathroom. Functionally located laundry room. New energy efficient dual pane windows will keep your utility bills low and the interior very quiet. Central heat. You're going to spend countless hours enjoying the backyard's lush landscaping and gigantic brick patio. The oversized concrete driveway and 2 car attached garage provides plenty of room to securely park any and all of your vehicles off street. Call now for all the details and I'll gladly arrange a private tour."